Read a day-by-day account of the battle for control of key areas of Libya and for the latest on what's next for Libya, the opposition and Moammar Gadhafi, tune in to "AC360º" at 10 p.m. ET Thursday on CNN. 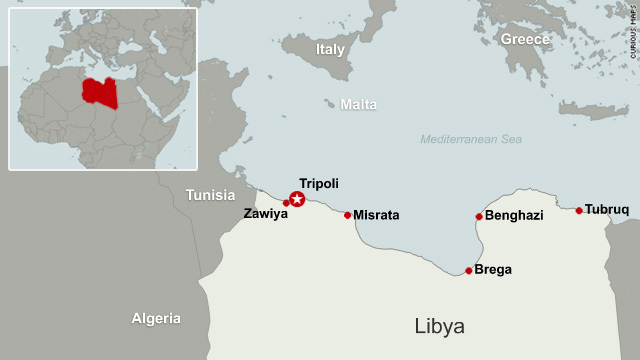 Ras Lanuf, Libya (CNN) -- Libya's ragtag rebels in Zawiya succumbed Thursday to better armed and organized government soldiers after enduring a week of attacks that left the coastal city strewn with the debris of war. The city's main Martyrs' Square was littered with the bombed-out, scorched carcasses of army tanks and other military vehicles. Workers were sweeping up the evidence as supporters of Libyan leader Moammar Gadhafi chanted slogans and waved green flags. "Today Zawiya, tomorrow Benghazi," ITV News' Bill Neely said a Gadhafi supporteer told him in a reference to Libya's main rebel-held city in the east. Neely said he was the first reporter to reach the city center Thursday after the government wrested its control from the rebels. He said doctors had told him that scores of civilians had been wounded or killed in the siege; they called the onslaught a massacre, a war crime. He counted more than 20 freshly dug graves. The city itself was quiet; shops were closed and houses appeared empty. The mosque's minaret was demolished, and spent bullets and other munitions lay on the ground with bloodied mlitary clothing. State-run television broadcast video of weapons and ammunition reportedly left behind by the rebels, whom the reporter referred to as "terrorists, dogs and traitors," Neely said. Government retaliation against the residents appears to have begun, said one man, who told ITV that government forces were carrying out house-to-house searches in Zawiya. "They start to arrest people, normal people," he said. "Some of them I know personally; they have nothing to do with what's happening." Battles also raged in and around the eastern city of Ras Lanuf and many other cities, with the regime using planes and heavy artillery in its effort to reclaim areas that had been taken by the opposition. Libya's state TV reported that "Ras Lanuf has been cleansed from the armed gangs connected to al Qaeda." A doctor who worked in Ras Lanuf said at least three people were killed and 30 wounded in fighting before the main hospital had to be evacuated. Doctors at a hospital in the city of al-Brega reported two deaths and more than 20 people wounded in fighting in Ras Lanuf. Opposition forces could be seen retreating from the city. Some fighters said they had pulled back to a checkpoint five miles east of the city, but it was not clear who was in control of the city. CNN's Ben Wedeman said the rebel forces appeared in disarray. "It's been a very chaotic effort on the part of the opposition fighters from the beginning," he said, adding that they had no command-and-control structure and little discipline. He credited them for their enthusiasm and spirit, but added, "Once the going gets tough, the ranks start to fall apart and it descends into anarchy, chaos." Saif Gadhafi, a son of Moammar Gadhafi and a prominent spokesman for the regime, vowed to retake eastern Libya as well and insisted his father still commanded support. "I receive hundreds of calls from the east daily and they are saying, 'Save us.' They are begging us and pleading for us to save them and my answer is two words. Listen to me and I want those armed groups to listen to me real well, and I want our people in the east to hear this as well: We're coming." He bristled at the possibility of military intervention. "The Libyan people they will never welcome NATO or Americans," he said. "Libya is not a piece of cake; we are not a Mickey Mouse." 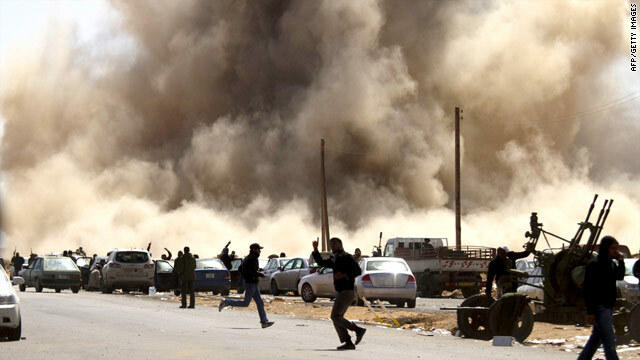 Though the Libyan government forces appeared to advance on the ground, the opposition gained momentum internationally. The French government recognized the newly created Libyan opposition movement as the sole representative of the country and the British foreign secretary spoke to an opposition representative over the phone. In response, Libyan state TV said the Gadhafi government would consider ending its relationship with France. In the United States, Secretary of State Hillary Clinton announced plans to meet with opposition leaders. She said the United States was suspending relations with the Libyan Embassy in Washington, and an administration official added the embassy "must shut down." But an official told CNN that "ending the operations of the Libyan Embassy does not mean we're cutting off diplomatic ties with Libya." America's top U.S. intelligence official, James Clapper, took note of Libya's military prowess at a Senate Armed Services Committee meeting Thursday. He said Gadhafi is in the fight for the long haul, with military far superior to that of the opposition. Clapper described the Libyan air defense as "substantial," saying it is the region's second-largest, after Egypt, but he did not address how fighting would fare against Libya if a no-fly zone or other military strategies were imposed. He said Gadhafi has a lot of aircraft, although many are not operational. To "some extent," he said, the aircraft have been used for attacks, but they have caused more structural damage than injury. In Brussels, Belgium, NATO defense ministers discussed the option of a no-fly zone over the North African country. Its secretary-general said any move to impose one would require a clear mandate from the United Nations. NATO also decided to bolster its presence in the Mediterranean Sea and perform detailed planning on humanitarian assistance. International military officials say the imposition of a no-fly zone could be complicated, but some opposition figures -- such as Mustafa Abdul-Jalil, a former justice minister who quit last month in protest and now heads the interim government in eastern Libya -- are advocating for the move. 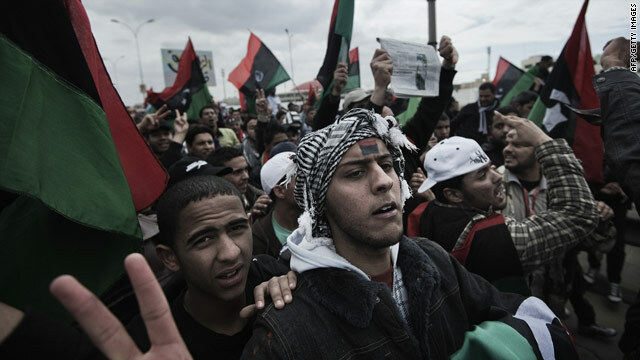 Gadhafi has said that imposing such a zone would simply unite Libyans behind him. Saying NATO is "united," "vigilant," and "ready to act," Anders Fogh Rasmussen, the group's secretary-general, said the body has begun round-the-clock airborne surveillance of Libya's airspace. "Time is of the essence," he said, adding that the crisis requires "close international coordination" among organizations such as NATO, the United Nations, the European Union, the African Union, and the Arab League. U.S. authorities have frozen $32 billion in assets tied to the Libyan regime, White House spokesman Jay Carney said. British Foreign Secretary William Hague spoke by telephone with Mahmoud Jabril, the National Transitional Council's special envoy. He said European foreign ministers on Thursday talked about how the EU should react "to the continuing appalling and unacceptable actions" of the regime. Hague "made clear that planning was under way on a full range of responses, including the possible establishment of a no-fly zone," the Foreign Office said in a statement. "It would need international support, a clear trigger and a legal basis. He also said that another diplomatic mission would be sent to Benghazi shortly." At the NATO meeting, U.S. Secretary of Defense Robert Gates said a no-fly zone option was still being considered, but was only in the planning stages. Gates added that any military response to Libya would need the United Nations to sanction it. Russian President Dmitry Medvedev signed an executive order banning the sale to Libya of arms, ammunition and military equipment, according to the Kremlin's website. The Council of the European Union Thursday announced it will extend restrictions against Libyan entities. As for Gadhafi's government, it has sought to influence international sentiment, announcing that its secretary of state for international relations will travel to Portugal, Greece and Malta on an exploratory, fact-finding mission that may include other destinations. The country has also invited British, French, Dutch and German fact-finding teams to examine reports of aerial bombardment and massacres. None has taken up Gadhafi on the offer. The United States will soon send disaster relief teams into eastern Libya, White House National Security Adviser Thomas Donilon said. He said the teams' activities should not be viewed as military operations. U.N. High Commissioner for Human Rights Navi Pillay on Thursday condemned the detention and possible torture by Libyan authorities of a BBC news team working to cover the conflict in Zawiya. The journalists, released from detention in Libya Wednesday, told of beatings and mock executions. The Guardian, a British daily newspaper, reported that one of its correspondents, Ghaith Abdul-Ahad, was missing. He was traveling with Andrei Netto of the Brazilian newspaper Estado, who was detained by authorities while reporting from Libya, the Guardian said. Netto was released Thursday and was to leave the country Friday.